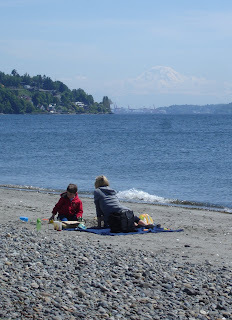 Discovery Park is the westernmost piece of Seattle. That's Mt Ranier looming over the Port of Seattle. Downtown isn't quite visible; it's hidden behind the Briarcliff neighborhood you can see to the left. It was Fort Lawton until the early 1970s. During WWII, there were as many as 1000 German POWs imprisioned here. Today, it's a vigorous ride down (and then back up from) the beach. There's no way aside from swimming to avoid the 320' hill between this location and the rest of the city.